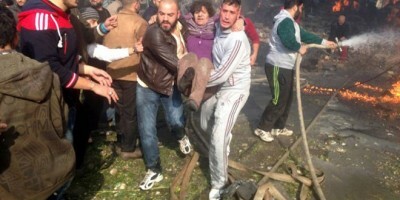 Damascus –The Cabinet condemned the terrorist bombing that rocked Homs city earlier today and left civilian casualties. This “cowardly” terrorist attack came in retaliation for the local reconciliations taking place in Homs province, said a statement by Prime Minister Wael al-Halaqi, referring to a most recent settlement agreement that will ensure clearing al-Waer neighborhood of weapons and gunmen. Such terrorist attacks, the statement added, will not succeed in intimidating the Syrians off the reconciliation track, but will rather boost their determination to continue fighting terrorism and consolidating national unity. In the Cabinet’s statement, the Premier held the countries supporting and funding terrorism fully responsible for the “barbaric massacres” committed in Syria, demanding that those countries stop their conduct. Today’s terrorist attack, carried out with a car packed with 150 kg of explosives, targeted the crowded al-Zahraa neighborhood, claiming several lives, injuring others and leaving massive material damage. The neighborhood has been previously targeted several times. The latest was on October 4 when a similar car bomb attack killed a civilian and injured 21 others. An attack on September 22 also left a civilian dead and 12 others wounded.